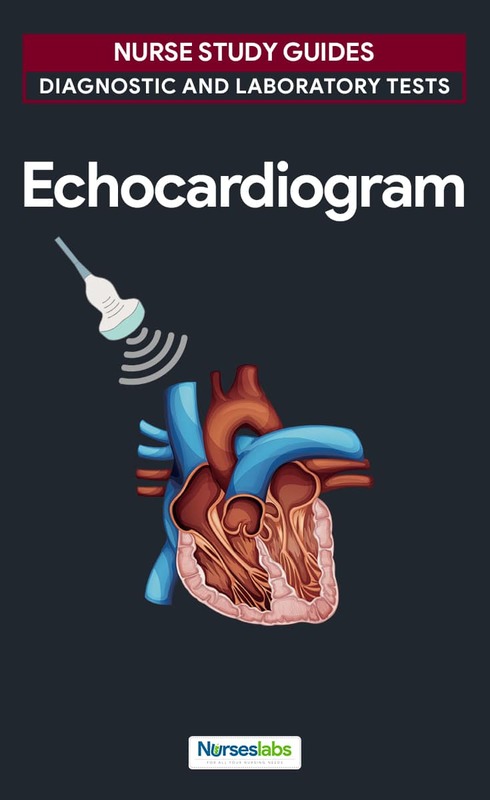 Echocardiogram, also known as echocardiography, or heart ultrasound is a noninvasive, painless test that uses high-frequency sound waves to visualize the shape, size, and movement of the structures of the heart. It is useful to evaluate patients with chest pain, enlarged cardiac silhouettes on X-rays, electrocardiogram (ECG) changes unrelated to CAD, and abnormal heart sounds on auscultation. In this test, a transducer directs ultrahigh-frequency sound waves toward cardiac structure, which reflect these waves. The echoes are converted to images that are displayed on a monitor and recorded on a strip chart or videotape. Results are correlated with clinical history, physical examination, and findings from the additional test. The techniques most commonly used in echocardiography are M-mode (motion mode), for recording the motion and dimensions of intracardiac structures, and two-dimensional (cross-sectional), for recording lateral motion and providing the correct spatial relationship between structures. 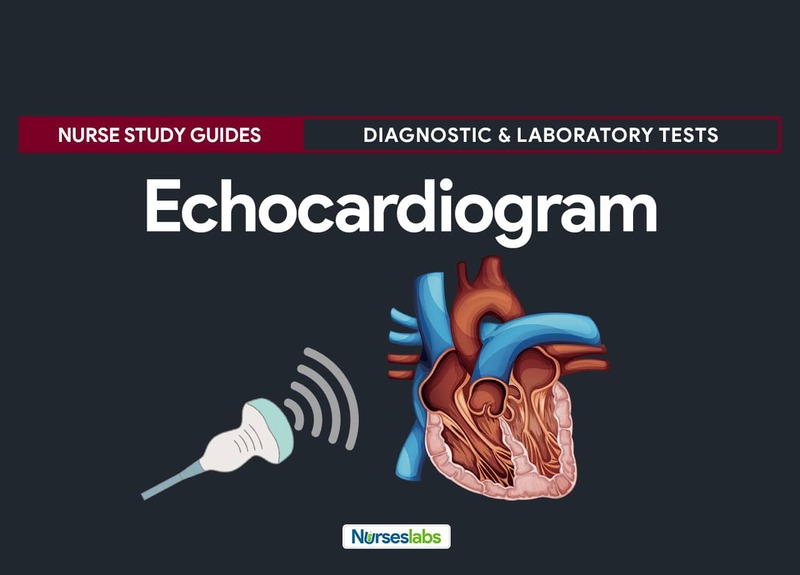 The responsibilities of a nurse during echocardiography includes explanation of the procedure to the patient, monitoring during tranesophageal and stress examinations, and establishing intravenous access for sonicated saline, microsphere contrast, and medication administration. Transthoracic Echocardiogram (TTE). It is the most common type of echocardiogram and is noninvasive. A device called transducer is placed on the patient’s chest and transmits ultrasound waves into the thorax. These waves bounce off the structures of the heart, creating images and sounds that are shown in a monitor. 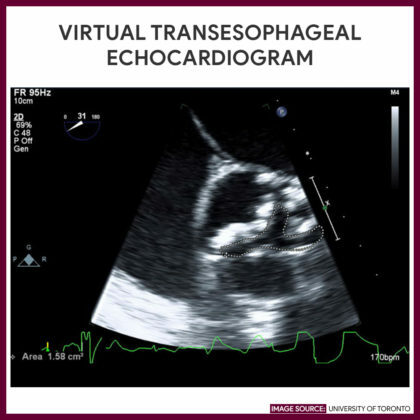 Transesophageal Echocardiogram (TOE). It is a special type of echocardiography that uses an endoscope to assist the transducer down to the esophagus where it produces a more detailed image of the heart than a transthoracic echocardiogram. Stress Echocardiogram. 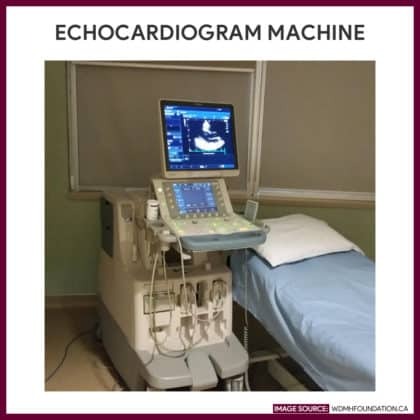 An echocardiogram that is performed while the patient is using a treadmill or stationary bicycle. This type can be used to measure the function of the heart both at rest and while exercising. Dobutamine Stress Echocardiogram. For patients who are unable to exercise on a treadmill, a drug called dobutamine is given instead through a vein that stimulates the heart in a similar manner as exercise. This type of echocardiogram is used to evaluate coronary artery disease and measures the effectiveness of cardiac therapeutic regimen. Doppler echocardiogram. Measures and assess the blood flow through the heart and blood vessels. Place patient in a supine position. Patient is placed in a supine position and a conductive gel is applied to the third or fourth intercostal space to the left of the sternum. The transducer is placed directly over it. The transducer directs ultra-high-frequency sound waves towards cardiac structures, which reflect these waves; the transducer picks up the echoes, converts them to electrical impulses, and relays them to an echocardiography machine for display. In motion mode (M-mode), a single, pencil-like ultrasound beam strikes the heart and produces a vertical view, which is useful for recording the motion and dimensions of intracardiac structures. In two-dimensional echocardiography, a cross-sectional view of the cardiac structures is used for recording the lateral motion and spatial relationship between structures. For a left lateral view, the patient is placed on his left side. The transducer is systematically angled to direct ultrasonic waves at specific parts of the patient’s heart. During the test, the screen is observed; significant findings are recorded on a strip chart recorder or a video tape recorder. Doppler echocardiography also may be used where color flow stimulates red blood cell flow through the heart valves. The sound of blood flow also may be used to assess heart sounds and murmurs as they relate to cardiac hemodynamics. Patient doing unnecessary movement during the procedure. Incorrect placement of the transducer over the desired test area. Patients who are dehydrated, resulting in failure to demonstrate the boundaries between organs and tissue structures. Patients who have a severe chronic obstructive pulmonary disease have a significant amount of air and space between the heart and the chest cavity. Airspace does not conduct ultrasound waves well. In obese patients, the space between the heart and the transducers is greatly enlarged; therefore, the accuracy of the test is decreased. Explain the procedure to the patient. Inform the patient that echocardiography is used to evaluate the size, shape, and motion of various cardiac structures. Tell who will perform the test, where it will take place, and that it’s safe, painless, and is noninvasive. No special preparation is needed. Advise the patient that he doesn’t need to restrict food and fluids for the test. Ensure to empty the bladder. Instruct patient to void prior and to change into a gown. Encourage the patient to cooperate. Advise the patient to remain still during the test because movement may distort results. He may also be asked to breathe in or out or to briefly hold his breath during the exam. Explain the need to darkened the examination field. The room may be darkened slightly to aid visualization on the monitor screen, and that other procedure (ECG and phonocardiography) may be performed simultaneously to time events in the cardiac cycles. Explain that a vasodilator (amyl nitrate) may be given. The patient may be asked to inhale a gas with a slightly sweet odor while changes in heart functions are recorded. Inform that a conductive gel is applied to the chest area. A conductive gel will be applied to his chest and that a quarter-sized transducer will be placed over it. Warn him that he may feel minor discomfort because pressure is exerted to keep the transducer in contact with the skin. Position the patient on his left side. Explain that transducer is angled to observe different areas of the heart and that he may be repositioned on his left side during the procedure. Remove the conductive gel from the patient’s skin. When the procedure is completed, remove the gel from the patient’s chest wall. Inform the patient that the study will be interpreted by the physician. An official report will be sent to the requesting physician, who will discuss the findings with the patient. Instruct patient to resume regular diet and activities. There is no special type of care given following the test. For mitral valve: Anterior and posterior mitral valve leaflets separating in early diastole and attaining maximum excursion rapidly, then moving toward each other during ventricular diastole; after atrial contraction, mitral valve leaflets coming together and remaining together during ventricular systole. For aortic valve: Aortic valve cusps moving anteriorly during systole and posteriorly during diastole. For tricuspid valve: The motion of the valve resembling that of the mitral valve. For pulmonic valve: Movement occurring posterior during atrial systole and ventricular ejection, cusp moving anteriorly, attaining its most anterior position during diastole. For ventricular cavities: Left ventricular cavity normally an echo-free space between the interventricular septum and the posterior left ventricular wall. Right ventricular cavity: Normally an echo-free space between the anterior chest wall and the interventricular septum. In mitral stenosis: Valve narrowing abnormally because of the leaflets’ thickening and disordered motion; during diastole, both mitral valve leaflets moving anteriorly instead of posteriorly. In mitral valve prolapse: One or both leaflets ballooning into the left atrium during systole. In aortic insufficiency: Aortic valve leaflet fluttering during diastole. 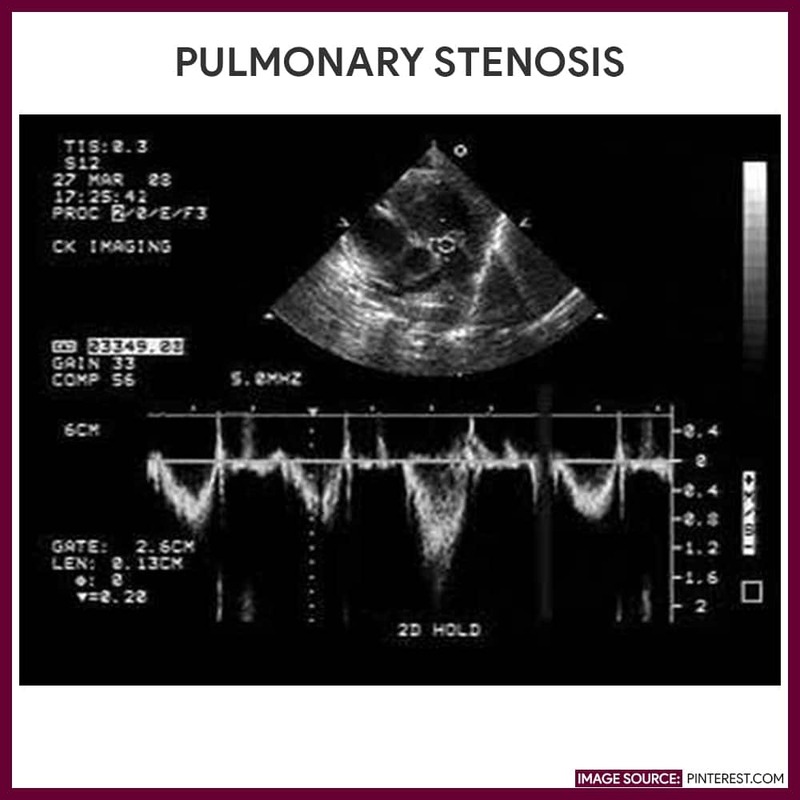 In stenosis: Aortic valve thickening and generating more echoes. In bacterial endocarditis: Disrupted valve motion and fuzzy echoes usually on or near the valve. Large chamber size: May indicate cardiomyopathy, valvular disorders, or heart failure: small chamber size: may indicate restrictive pericarditis. Hypertrophic cardiomyopathy: Identified by a systolic anterior motion of the mitral valve and asymmetrical septal hypertrophy. Myocardial ischemia or infarction: May cause absent or paradoxical motion in ventricular walls. Pericardial effusion: Fluid accumulates in the pericardial space, causing an abnormal echo-free space. In large effusions: Pressure exerted by excess fluid restricting pericardial motion. 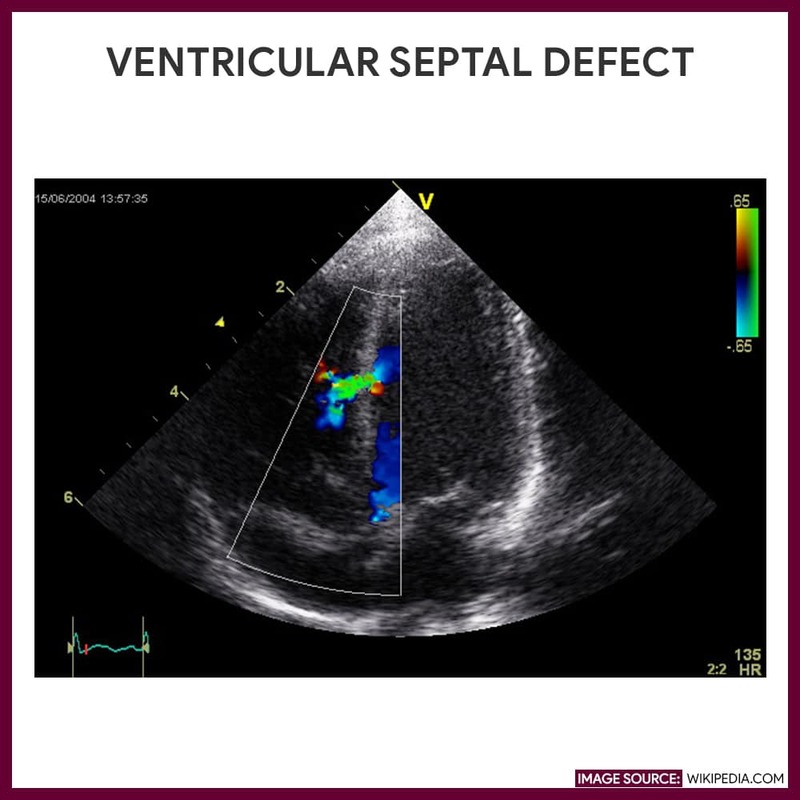 Ventricular septal defect shown in echocardiogram. Machine used for an echocardiogram. This 89-year-old man with a history of coronary artery disease (status post coronary artery bypass) had an ejection fraction of 20% and significant obstructive lung disease. The procedure was initiated under conscious sedation with transthoracic echocardiographic imaging, but, just after the stiff wire was placed (A, red arrow), the patient became severely hypotensive and required emergency intubation and transesophageal echocardiography probe placement. After confirming the absence of ventricular perforation and tamponade but confirmation of poor systolic function (B), an emergency transcatheter aortic valve replacement was performed during intermittent chest compressions (C). Severe paravalvular regurgitation (D, yellow arrows) was successfully treated with a post-dilation (E); however, the patient died 3 days later. Henry, W. L., DeMaria, A., Gramiak, R., King, D. L., Kisslo, J. A., Popp, R. L., … & Weyman, A. E. (1980). 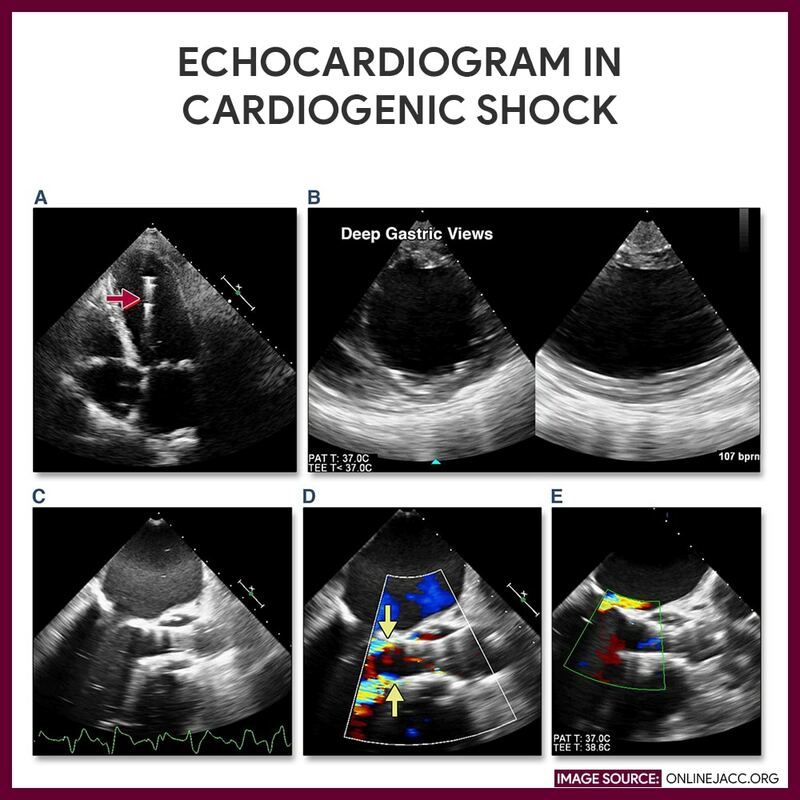 Report of the American Society of Echocardiography Committee on nomenclature and standards in two-dimensional echocardiography. Circulation, 62(2), 212-217. Gottdiener, J. S., Bednarz, J., Devereux, R., Gardin, J., Klein, A., Manning, W. J., … & Schiller, N. B. (2004). 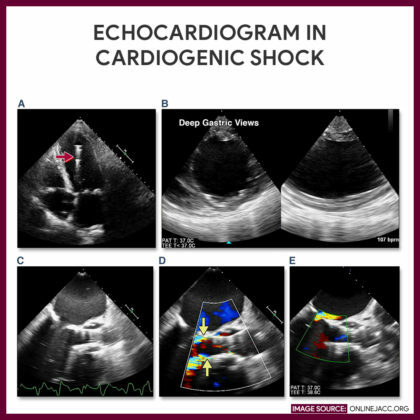 American Society of Echocardiography recommendations for use of echocardiography in clinical trials: A report from the american society of echocardiography’s guidelines and standards committee and the task force on echocardiography in clinical trials. Journal of the American Society of Echocardiography, 17(10), 1086-1119. Erbel, R., Daniel, W., Visser, C., Engberding, R., Roelandt, J., Rennollet, H., & For, T. E. C. S. G. (1989). Echocardiography in diagnosis of aortic dissection. The Lancet, 333(8636), 457-461.